This delicious Autumn Harvest Soup with Butternut Squash and Kale has some of my favorite fall and winter ingredients, and this great Meatless Monday soup is also South Beach Diet Phase Two. Check out Soup Recipes for more tasty and healthy soups! 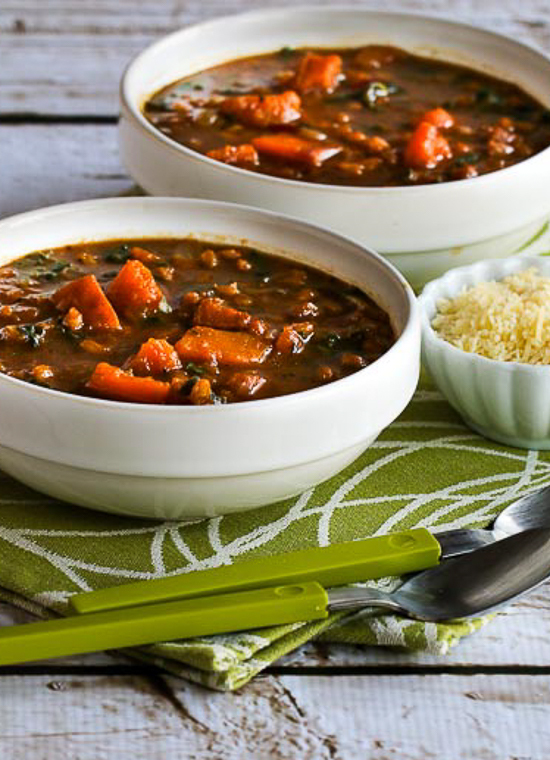 Click here to PIN Autumn Harvest Soup with Butternut Squash and Kale. Sometimes recipes that just come together out of whatever’s on hand turn out to be some of my favorites, and this Autumn Harvest Soup with Butternut Squash, Kale, and Farro (or Brown Rice) is one I came up with when I had butternut squash and kale in the fridge. The secret ingredient in this soup is the Farro I’d been craving ever since I tried it in Farro with Mushrooms. The butternut, kale, and farro combination here was wonderful, but if you wanted a gluten-free version you could make this with brown rice, which would also be very tasty. If you’re using farro, start by soaking it for at least 15 minutes. If you don’t want to Peel and Cut Up a Butternut Squash, I think pre-cut squash cubes are great for soup. Cut the squash into pieces not more than 3/4 inch across. Saute the diced onion with the thyme and sage. Add the stock to the onions and herbs and bring to a low simmer; then add the farro and simmer 10 minutes. (You can skip this extra ten minutes if you’re using brown rice.) Add the squash cubes and simmer about 30 minutes. Mash the squash a bit so some pieces will thicken the soup, then add the kale and simmer 20-30 minutes more. Stir in a little balsamic vinegar if desired, and serve hot. This is good with a little Parmesan cheese sprinkled on at the table. Cut butternut squash into cubes not more than 3/4 inches across. Chop onion, then heat olive oil in bottom of large soup pot, add onion and saute about 5 minutes. Add thyme and sage and cook 2-3 minutes more. Add chicken or vegetable stock to the soup pot and bring to a low simmer. Add butternut squash cubes and simmer about 30 minutes, or until squash is quite soft. Use a potato masher to mash some of the squash so it dissolves into the soup, leaving other pieces whole. While soup simmers, wash and chop kale. If desired, stir in a tablespoon or two of balsamic vinegar right before you serve the soup. I used homemade chicken stock, but you can use canned stock or stock from a carton. 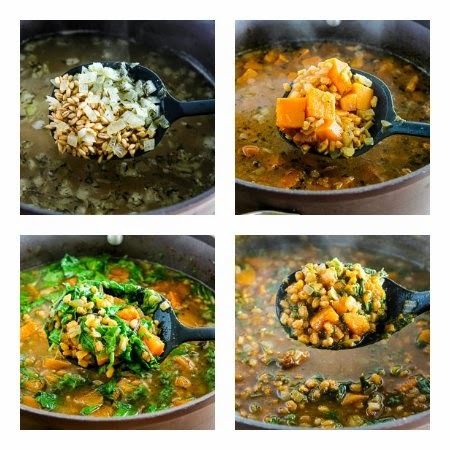 The use of butternut squash and farro would make this Autumn Harvest Soup with Butternut Squash and Kale phase two or three for the South Beach Diet. You could make a lower carb soup by making this with Cauliflower Rice, but soup with butternut squash will never be suitable for strict low-carb diets. Delicious! I accidentally used barley instead of farro (had stored in an unmarked jar) and still heavenly! So glad you reposted this recipe–it's a winner! Do you really mean 6 quarts of stock, or is it 6 cups? Yikes, 6 cups is right! Thanks for catching that, will fix right now. Thanks June, and I agree that Farro is just so delicious! Made this soup on Tuesday for dinner but used regular green kale as I couldn’t find the red. The farro was easier to find then I imagined, right there on the shelf of my Stop and Shop. Hearty, satisfying, as well as delicious. I really like to make soups starting this time of the year, so thanks for adding one to my list. It is a keeper. What a healthy, hearty and tasty sounding soup. This looks fanatstic, especially for the chilly fall day that it is! I love everything about this soup, Kalyn– the colors, the flavor, and the nutritional boost! I’m planning on posting on a red lentil and kale soup in which I used red kale too. Butternut is so beautiful in soup. What a perfect autumn combination. Lovely. Great looking soup the the flavour contrast of sweet squash against earthy kale sounds yum. This looks like a hearty soup! 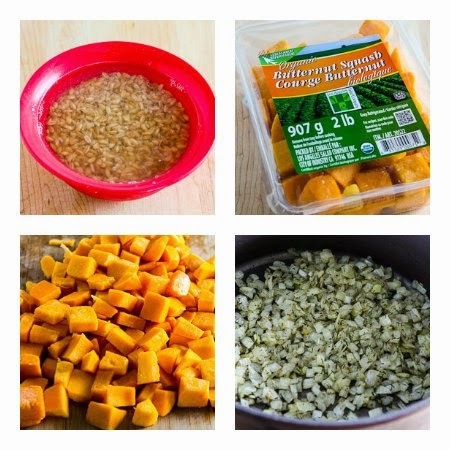 I love butternut squash and I’m off to check out your post on how to peel and cut it up! mmmm…Kale and butternut squash – two of my favorite things, together in one pot. Yummy! What a fantastic recipe Kalyn and you’re so lucky to have that garden! I was relieved to find that I cut Butternut Squash in exactly the same way as you recommend. Some of the best soups are born of the simple expediency of using whatever is left over, or what needs to be used up. I think it forces us to try combinations we might never have thought of otherwise. Am I nutty but I really do find this soup can sweep me off my feet! So beautiful! Healthy and no body would know ;0) until you tell. Thanks to everyone for the nice thoughts about this. I was so happy with how it turned out. For those who haven’t tried farro, it’s very much worth looking for. I can’t find it anywhere in Salt Lake so far (although I am going to try the Italian market on the other side of town.) I know you can buy it at Amazon.com if all else fails. I’m lobbying my local whole foods to carry it, but they look at me like I’m crazy. I did buy a bunch of it in Boston and had it shipped, but it hasn’t arrived and I’m getting worried because a few other things that were supposedly mailed to me haven’t shown up either. Fingers crossed that I will get it! So glad to see that farro made it safely from Boston and into this wonderful soup. The recipe epitomizes Fall for me — dark greens, winter squash, hearty grains. Kalyn, what a delicious soup. Farro is really a fabulous grain. I don’t eat it often enough but everytime it comes into my kitchen i keep asking myself why i don’t have it more often. I have loads of kale at the moment so i can easily reproduce your dish. I am a big fan of farro, kale, & sqaush so this a home run – thanks for sharing! That soup looks wonderful ! I have never heard of farro either but I will be looking for it. Kalyn what a beautiful soup! I love your recipes! You enlighten me so much on using veggies in different ways and branching out and trying the unknown! Great recipe! It looks so fresh, healthy and totally delicious. I love it! This looks great, I am very into farro these days – although I haven’t soaked it ahead of time. Interesting.